These days, when children come in for their appointment at VCC, they encounter monkey arms reaching out from a tree; Martians staring down from the ceiling in the exam room; 3-D bugs and butterflies; and books on shelves, books under seats and books on trees. For pediatric patients and families at Vista Community Clinic (VCC), a visit to the medical provider is now an opportunity to read, explore and learn. A just-completed remodeling project has transformed the entire pediatric unit at VCC’s flagship clinic on Vale Terrace Drive in Vista into an attractive, educational and interactive space for young patients and their families. The waiting area brings the outdoors inside with a large sculpted life-like tree with books hanging on branches. A wall, with sculpted bushes and games for children, divides the well and sick areas. Lime green cushioned box seating has replaced hard backed chairs. Each exam room has a sculpted element and a mural with themes such as cars, trains, magic, garden, space, animals and hidden treasures. The design and installation of the VCC pediatric remodeling project was done by Working Designs and Installations, a New Jersey-based design and fabrication company. 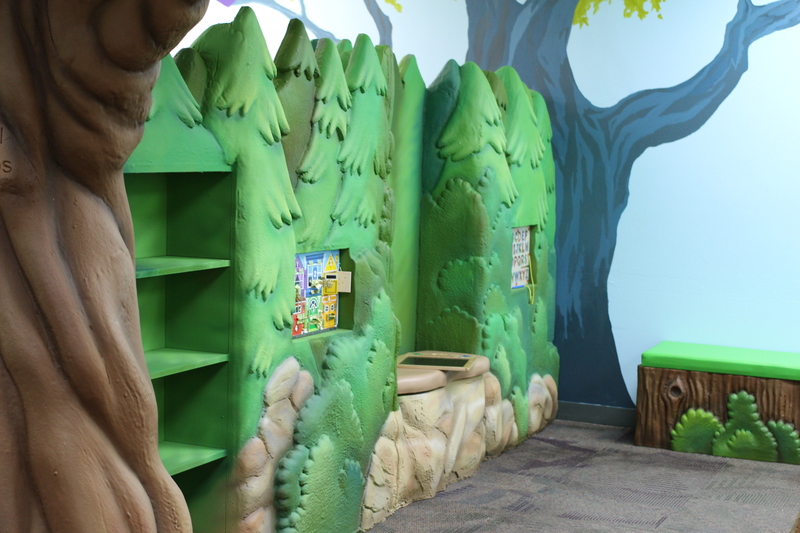 The overarching goal of the remodeling project was to use the time spent in the doctor’s office to spark and nurture children’s interest in reading.